A 1787-92 war with Russia ended in defeat for the Ottomans. The sultans were unable to introduce much needed military reforms mainly because these were opposed by the Janissaries; the members of this corps, who originally were the Sultan's personal army, played a role similar to that of the Praetorians during the Roman Empire; when the sultans were unable to satisfy their requests, they did not hesitate to rebel and to force their masters to abdicate. Sultan Selim III (1789-1807) enjoyed a few years of peace between 1792 and 1796 when Austria and Russia were busy dealing with the effects of the French Revolution. In 1798 Napoleon did not hesitate to break the traditional French-Ottoman alliance and invaded Egypt; in the following years the Sultan was the object of opposite pressures from France and from the coalition of the other European powers to stand on their side; the growing weakness of the Ottoman Empire became very evident. 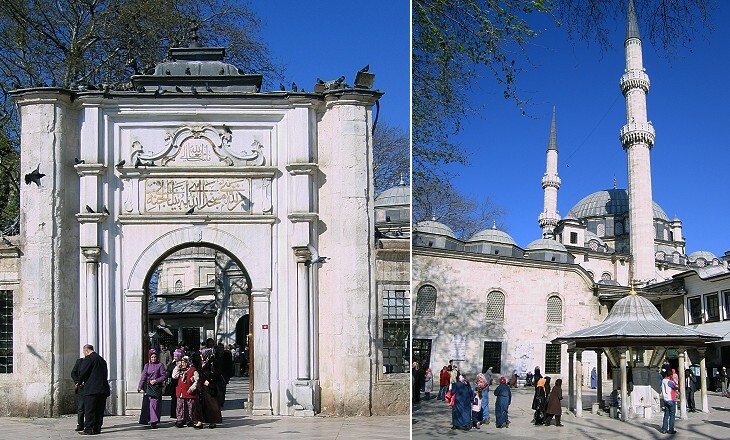 The kulliye built by Sultan Mehmet II on the burial place of Eyup, the standard-bearer of the Prophet, was damaged by the 1766 earthquake which damaged Sultan Fatih Mehmet Camii. 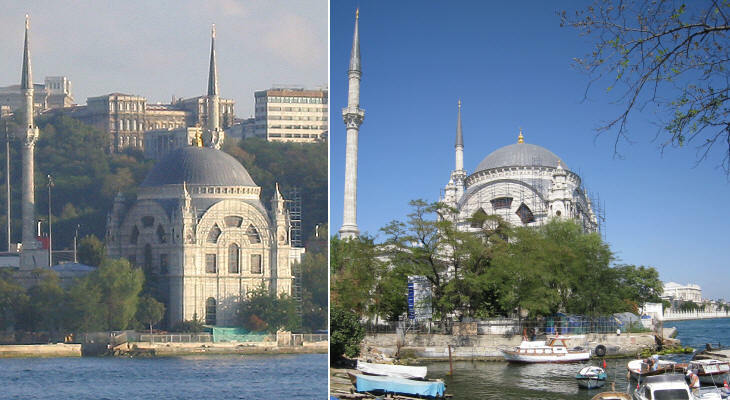 In 1798 Sultan Selim III started the reconstruction of the complex: its decoration is very baroque whereas the mosque has a more classical design. Mihrisah Valide Sultan, the mother of Sultan Selim III, chose Eyup to build her own turbe which has a very elegant sebil. 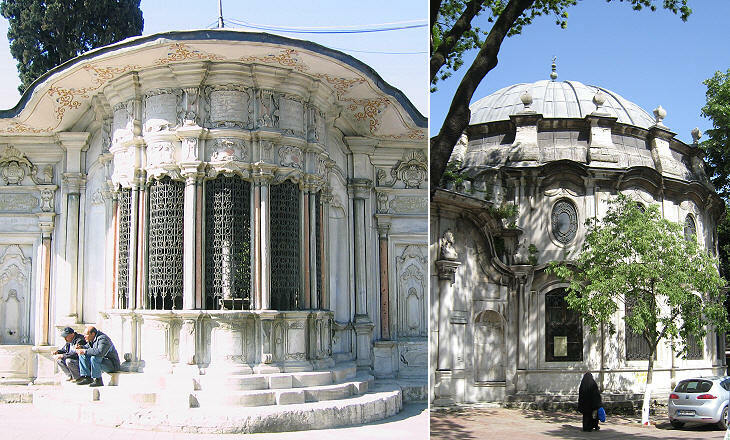 Her turbe is similar to that built a few years later by Naksidil Valide Sultan, mother of Sultan Mahmut II. According to tradition she was a French heiress and similar to Gulbahar, the wife of Sultan Mehmet II Fatih, she remained a covert Christian until her death: she is thought to have influenced the Ottoman policy in favour of France after her son became sultan in 1808. In 1813 Gioacchino Rossini wrote Italiana in Algeri, an opera about the ability of a captured young woman to become the queen of the harem. The premiere took place in Venice and probably the audience was aware of the rumours about Naksidil's past. 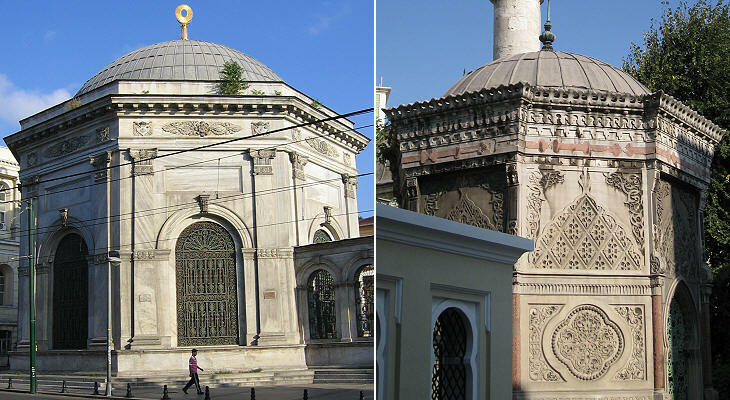 Sah Sultan was a sister of Sultan Selim III and she too chose to be buried in Eyup; her turbe is interesting because the traditional octagonal shape is replaced by a circular plan. Sunbul Efendi was the founder of the Sunbuli order, which originated from the Dervish one. His name means hyacinth. 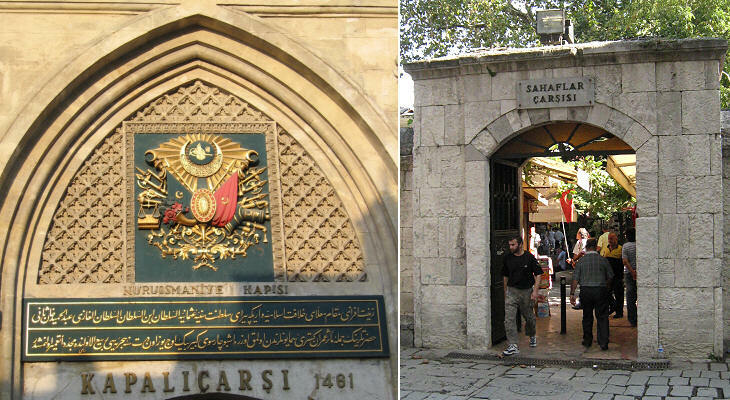 He died in 1529 and he was buried at Koca Mustafa Pacha Camii. His turbe was modified several times until it was given a partly circular shape. He is still regarded as a sort of saint and his turbe is visited by many believers, especially during Ramadan. The long reign of Sultan Mahmut II (1808-39) was marked by the implementation of a series of reforms, which included the adoption of western clothing by the sultan. 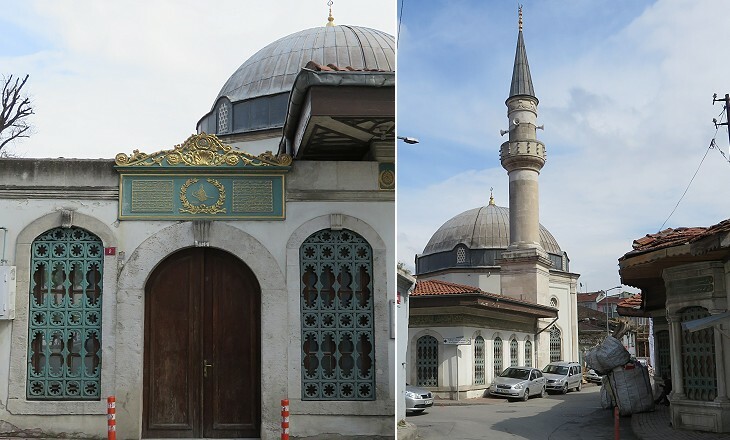 The Sultan eventually disbanded the Janissary corps and celebrated the event by naming a mosque he was in the process of completing Nusretiye (of the victory). The mosque was designed by Kirkor Balyan, an Armenian architect who had studied in Paris: his works were influenced by the imposing Empire style which originated in France during the First Empire. Sultan Mahmut II's signature reads: Mahmut, son of Abdulhamit is forever victorious. However he had little reason to celebrate: it is true that in 1822 the Ottoman army quelled the revolt of Ali Pacha of Tepeleni, but Sultan Mahmut II had to accept the independence of Greece, a highly autonomous government in Egypt and the 1830 occupation of Algeria by France. 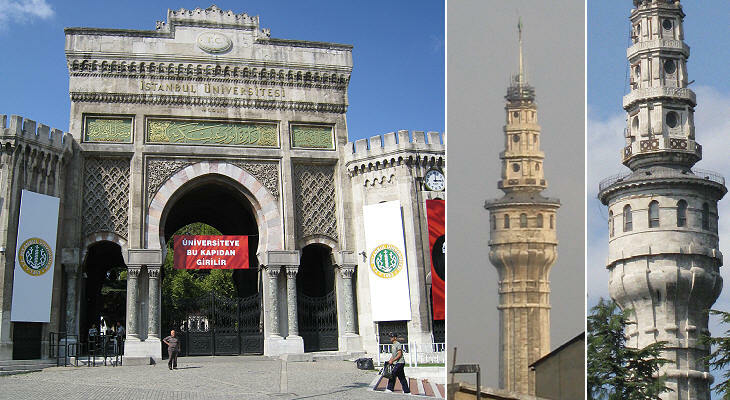 The high tower built by the sultan on the site of today's Istanbul University has become part of the city's skyline but it is usually named after Sultan Beyazit rather than Mahmut because it is located near Sultan Beyazit Camii. 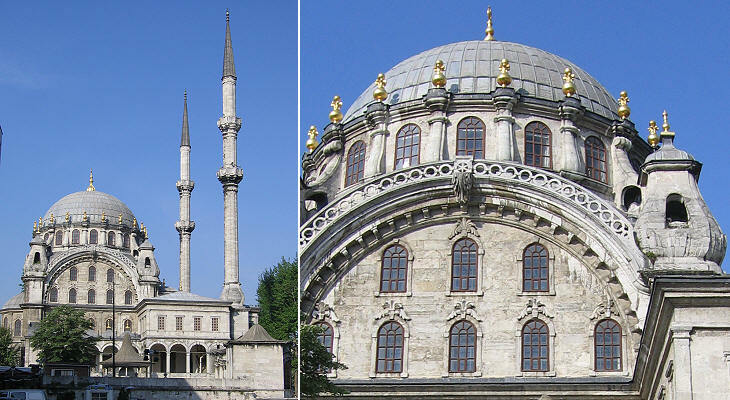 Sultan Mahmut II built a turbe for himself the design of which departs from the Ottoman tradition (exception made for the shallow dome). 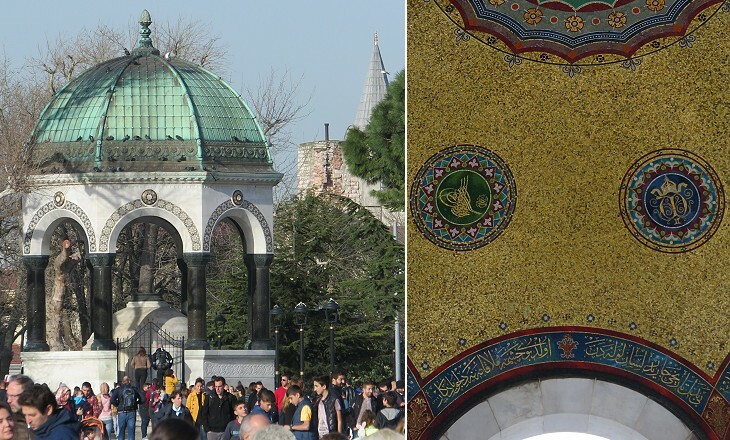 The building was praised by Mark Twain who toured Constantinople in 1867: he described the tomb as the neatest piece of architecture that I have seen lately; the American writer saw it after visiting Hagia Sophia of which he said: I do not think much of the mosque St. Sophia. (The Innocents Abroad). 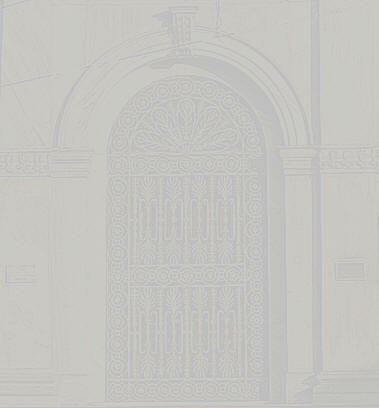 A detail of the turbe grill can be seen in the image used as background for this page. Fuad Pacha (1815–69) was a Turkish statesman known for his role during the Crimean War and in the Westernization movement within the Ottoman Empire. He held for many years the role of minister for foreign affairs, a post which was created by the reforms brought about by Sultan Mahmut II and by his son Abdulmecit I (1839-61). 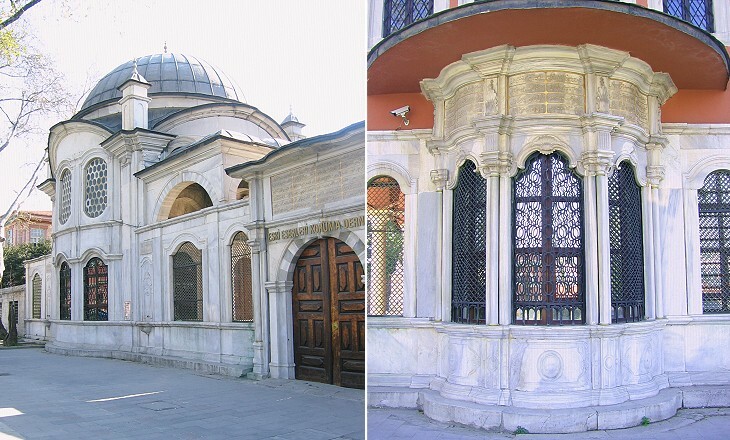 The small mosque named after him is another indication that eclecticism (combination of different styles) characterized the architecture of Constantinople during the XIXth century. Sultan Abdulmecit I inherited the throne when he was sixteen and he had to immediately face the revolt of Mehmet Ali, Viceroy of Egypt. France and Britain promptly came to his rescue and forced Mehmet Ali to withdraw: the Ottoman Empire had become the Sick Man of Europe according to Tsar Nicholas I. It stood only because the Great Powers did not agree on how to partition it. The young sultan accelerated the reforms meant to transform the structure of the Empire into that of a modern European nation. 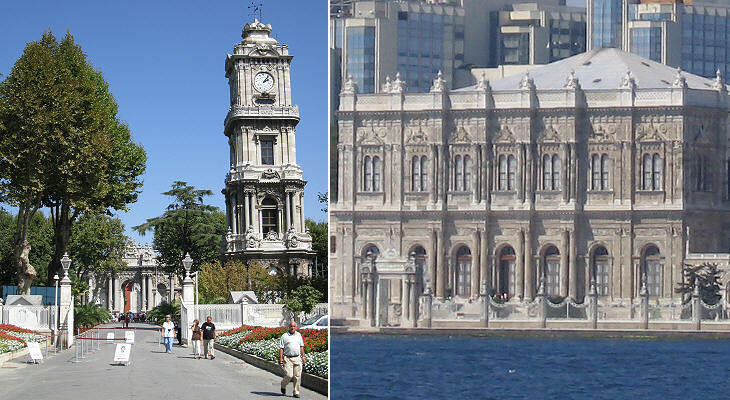 The relocation of the court at Dolmabahce Sarayi in 1856 can be regarded as the most symbolic act of his government. The modern palace was designed by Nikogos Balyan, a grandson of the architect of Nusretiye Camii. Dolmabahce means filled-in garden, because it was a Bosporus inlet before being filled in to create a royal park where eventually the palace was built. The imposing clock tower was the first of a series which the sultans built in the main cities of the Empire. Abdulmecit I tried to contain the nationalist movements which were growing in the European provinces. He stressed the multicultural aspect of the Ottoman nation: the army was reorganized and non-Muslims were allowed to join it; civil and criminal codes were developed on the basis of the French ones; non-Muslims were no longer subject to higher taxation; modern universities and academies were founded. Finally the clothing reform introduced by his father was completed with the outlawing of the turban. The construction of a mosque (designed by Nikogos Balyan) near the sultan's palace was a minor concession to Muslim religious authorities. Sultan Abdulaziz (1861-76) pursued the reforms to modernize the Ottoman Empire, but the finances of the state and the lack of an entrepreneurial middle-class blocked that industrial revolution the empire badly needed; banks, public facilities and railways all belonged to foreign companies; a new city, the Ville de Pera was developed on the hill behind Galata; the Grand Rue de Pera, its main street, is the centre of today's Istanbul and it is now called Istiklal Caddesi (Independence Street); here lived the Levantines, a cosmopolitan community which controlled the Ottoman economy. Churches, palaces, shops, restaurants and hotels made Pera similar to a Paris district. 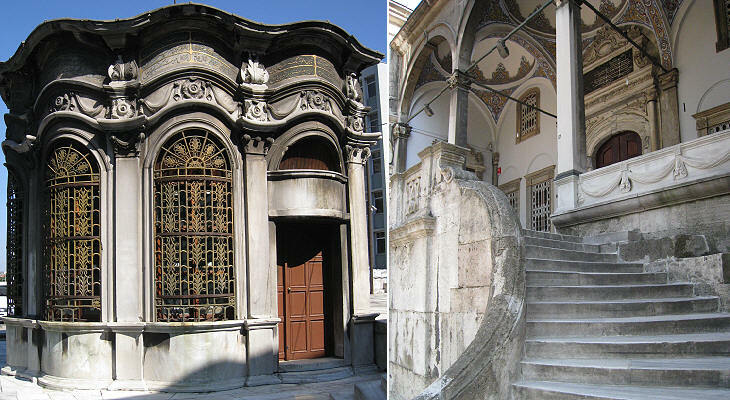 The quarter is now known as Beyoglu, a reference to the fact that the Bailo, the Venetian Ambassador in Constantinople, had his residence in this district: his Palazzo di Venezia is now the Italian Consulate. 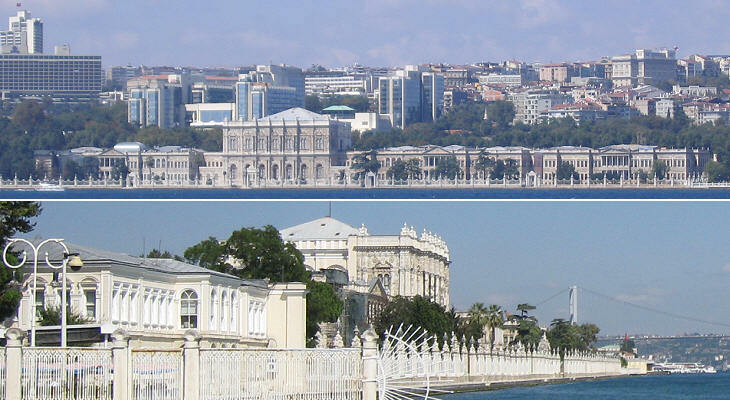 In 1874 Abdulaziz built Ciragan Sarayi a short distance from Dolmabahce Sarayi; this waste of public money increased the general discontent and the sultan was forced to abdicate; five days later he died in his palace; he was replaced by his son Murat V, who was deposed after three months and spent the rest of his life (he died in 1904) as a prisoner in Ciragan Sarayi. The palace was greatly damaged by a fire in 1910 and it was almost entirely reconstructed a few years ago: it is a luxury hotel which claims that guests can relax in its facilities "as the Sultans once did": clearly the hotel management are sure their guests know nothing about the unhappy Sultans who actually lived there. 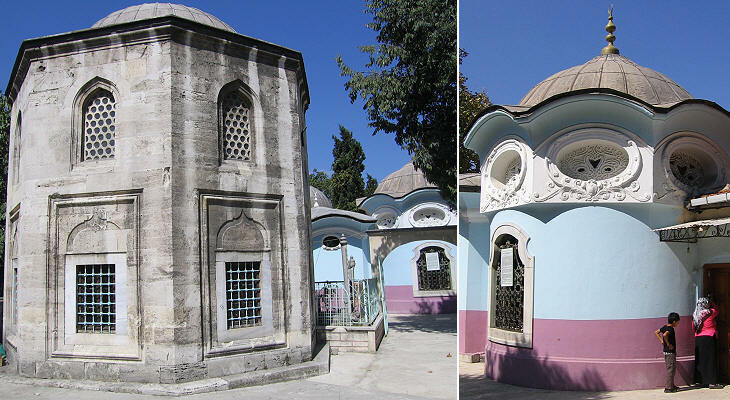 This small complex near Silivri Kapi was initially built in 1457 by a commander who served under Sultan Mehmet II. It fell in abandonment and it was rebuilt during the reign of Sultan Abdulaziz (1861-76), but in 1894 it was greatly damaged by an earthquake. Its current aspect is due to initiatives by Adile Sultan, daughter of Sultan Mahmut II and a philanthropist, and by Sultan Abdulhamit II. (*) At all hours of the day and night, young men from eastern Turkey can be seen in the streets of Istanbul hauling enormous loads of what appears to be trash, but is a semi-clandestine recycling operation. Sultan Abdulhamit II reigned in 1876-1909. He established strong political and economic ties with Germany. In 1889 and 1898 Kaiser Wilhelm II visited Constantinople. In order to celebrate his second visit he donated a small fountain to the Sultan. It was made in Germany and then assembled in the northern part of the Hippodrome in 1900. During the last quarter of the XIXth century the Ottoman Empire had to concede independence to Serbia, Romania, Montenegro and Bulgaria and to cede Thessaly and Crete to Greece. The nominal sovereignty over Cyprus and Egypt was lost. The eastern Anatolian province of Kars was annexed to the Russian Empire. The new century saw the end of the Ottoman Empire; in 1911-12 Italy conquered Libya and Rhodes with the nearby islands; soon after Serbia, Greece, Bulgaria and Romania attacked the Ottoman Empire and reduced its territories in Europe to just Eastern Thrace. The Sultan entered World War I on the side of the German and Austrian Empires. In 1918 the Ottoman Empire surrendered and in 1920 the Treaty of Sevres partitioned its territories; France and Britain occupied Syria, Lebanon, Palestine and Iraq. Conditions were so humiliating that a Turkish national movement, led by Mustafa Kemal Pacha (Ataturk) opposed the occupying powers. In 1922 the Sultanate was abolished and in the next year the Republic of Turkey was proclaimed: its capital was Ankara; after nearly 1600 years Constantinople was no longer the centre of an empire; the city was officially renamed Istanbul. The Great Bazaar was founded by Sultan Mehmet II Fatih in 1461, but the current series of buildings which house it are the result of a series of additions and modifications which span the whole Ottoman period of the city. We went to the great Bazaar in Stamboul, of course, and I shall not describe it further than to say it is a monstrous hive of little shops -- thousands, I should say -- all under one roof, and cut up into innumerable little blocks by narrow streets which are arched overhead. One street is devoted to a particular kind of merchandise, another to another, and so on. (Mark Twain - The Innocents Abroad). When you wish to buy a pair of shoes you have the swing of the whole street -- you do not have to walk yourself down hunting stores in different localities. It is the same with silks, antiquities, shawls, etc. The place is crowded with people all the time, and as the colored Eastern fabrics are lavishly displayed before every shop, the great Bazaar of Stamboul is one of the sights that are worth seeing. It is full of life, and stir, and business, dirt, beggars, asses, yelling peddlers, porters, dervishes, high-born Turkish female shoppers, Greeks, and weird-looking and weirdly dressed Mohammedans from the mountains and the far provinces -- and the only solitary thing one does not smell when he is in the Great Bazaar, is something which smells good (Mark Twain - The Innocents Abroad). Today some of the historical trades of the Bazaar are remembered only by the name of streets: at the time of Twain's visit it was stocked with more unusual and distinctive wares than it is today. 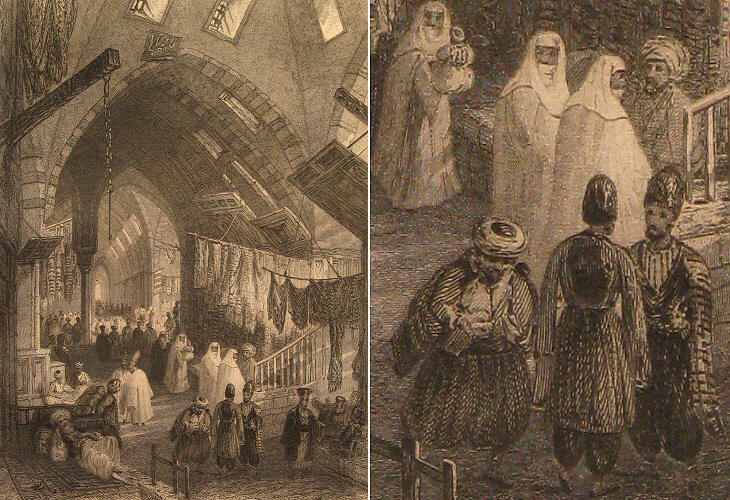 The Grand Bazaar is a "must see" on all tours of Istanbul; even the very short tours for those who come to Istanbul on a cruise include the Grand Bazaar; these modern crowds however are not as varied and picturesque as those shown by W. H. Bartlett in his etching. 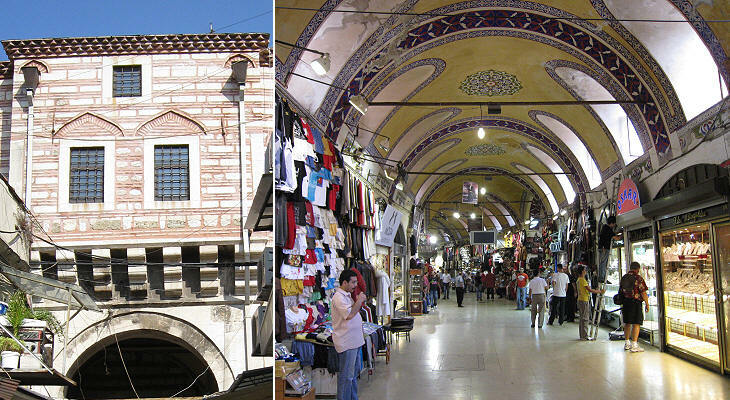 The Great Bazaar has a minor addition near Yeni Cami; it is known as the Egyptian Bazaar because its maintenance was paid with taxes coming from Egypt. It houses shops which sell sweets and spices.